I have a wonderfully beautiful and talented daughter. Really she is..BUT she truly lacks confidence. We have been battling this for most of this Freshman year. Oh I know that part of it is her age..she’s 15, BUT..I believe it’s more than that. She looks confident and her gifts and talents would never “show” a lack of confidence and yet I see her not living up to her full potential, holding back…. a Mom knows. I’ve talked to her about this many times and have come to the conclusion, it’s about her relationship with God. It takes time to be FILLED, to know who we belong to, our heritage. It sometimes takes the hard times, the hard things that require us to be close to God or we drown. I want to fix my daughter, desperately..she is my baby, but she must only be filled and consumed by God. Then she will someday walk into a room and know, no I don’t mean know I mean KNOW, whom she belongs to. She will be unshakable, unwavering. As a parent the one thing I can do is joyfully give her Gods Amazing Word…to hide in her heart. To ponder for the day. For His Word will not return void. It’s a promise! Oh I’ll have to sneak these little Bible verse Cards here and there..but she’ll read em…I know she will.. because that empty place longs to be filled..no not filled..FILLED! 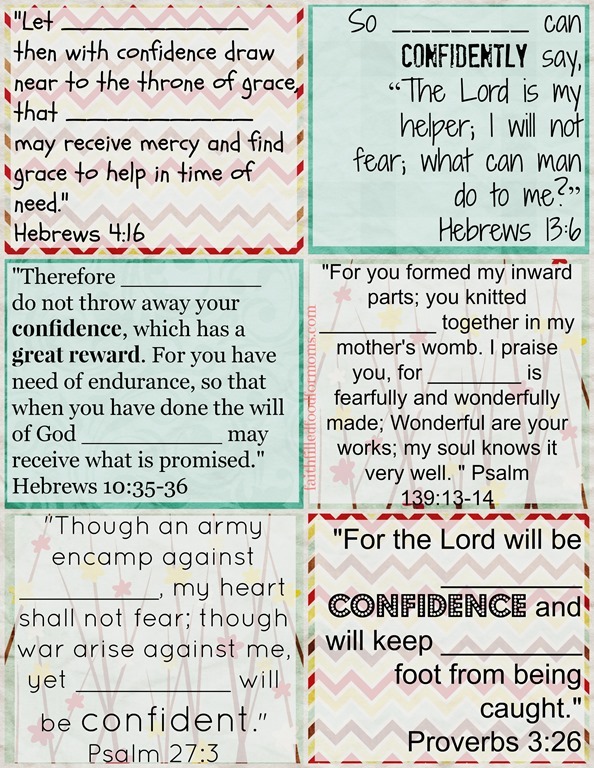 Whether one of your children, you or a friend lack this confidence… I pray that these printable bible verse cards to personalize on confidence will build you/them up…to KNOW and be FILLED. I so am where you are with your daughter except my little girl is 14. Her confidence will come when she comes to the realization of who she is in Christ. I was saved at 25, and I knew God loved me enough to give me a another chance at life. (My testamony) But thru the years, hearing from church people and ect…this ishow you are supposed to be walking, and knowing that I wasnt responding in Love ect…or acting as other christians thought I should act, slowly began to change my preception of who I was in Christ. The devil uses christians to bring other christians to that point ya know. It got to the point that I believed God loved me because God loves everyone and he is love so he HAS to love me. He doesnt like me, but because who he is (Love) he has to love me because of Jesus. Well…..my relationship with God was…hmmmm….one sided. I loved God but I had to act right for God to love me. When I was 50, I was really going thru some hard times and I fasted for a week! afterwards, one morning I was on phone talking to a prayer person and he gave me a scripture. After our conversation I looked this scripture up and as I was reading it BAM, lickety split, I was so comprehending Gods Love for ME. JUST ME! Not everyone cause he has to love them But ME personally. I knew God placed it there at that moment cause I felt different. It was nothing I did to understand it, it was there! I am almost 53, and no I am still not perfect, but in Gods Eyes I am HIS. And he LOVES me because you see, Jesus saved me by GRACE, unmerited FAVOR. Meaning I dont work at all for GODs love! He loves me He loves me, He loves me WOOOOWHOOOO he loves me. When your daughter begins to realize in her heart, not just her HEAD, the realization of Gods Love for her, that is when you will see the change. She may say yes I know God loves me, but its in her head more than her heart. My daughter has been raised to see God all around us, she KNOWS in her head, but her heart still needs convincing. And you wouldnt know it, but Moms always know 😉 You Pray for my daughter, and I will pray for yours! I WILL pray for your daughter and thank you so much for praying for mine Sister! May the Lord continue to bless you richly with His great Love and amazing grace! I pray that these confidence cards would also be used for His glory and that others would come to KNOW His great love for them. HA!! you do believe as I do lol. Get that Legalism series wrote and Published!!! People are begining to realize that everything we were taught, from our parents, was taught to them from thier parents and to them from thier parents. Understand? Its like we tend to believe what we are taught because thats what the majority believes. But we are NOT under the law anymore but GRACE because of Jesus!! I want to be the FIRST to read it lol lol. Her name is Meagan 🙂 and it is just us 2. Thanks so much for sharing this very special post on confidence. Those are really lovely printable scripture cards. I am just after you over at Titus 2 Tuersday.